New children’s book teaches Ethiopian American children about their first country. Stacy and Paul Bellward (Minnesota) adopted their oldest daughter 4 years ago from Ethiopia. Ethiopian adoption is growing…fast. Last year alone, 1,255 children came to the US. After adopting, the Bellward’s searched for resources to learn more about Ethiopia and specifically children’s books that would teach their daughter about the land she was from. “There were virtually no books about Ethiopia, especially for children. We knew we could to something about that,” says Stacy Bellward. In Ethiopian Voices: Tsions Life (July 31, 2008, www.amharickids.com) stellar photographs combined with first person and narrative text show personality and emotion while teaching about Ethiopian culture and even some Amharic words. It could be a children’s coffee table book, but with basic facts such as: coffee was discovered in Ethiopia and there is a huge castle in the Ethiopian mountains. 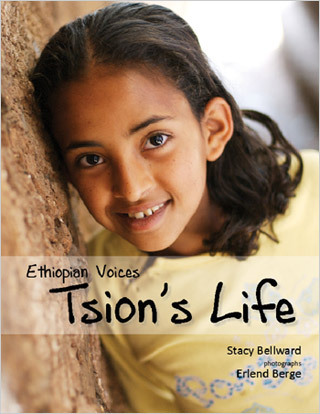 “Tsion’s Life is a project from the heart that was born from our adoptive experience but brings Ethiopia, its people and culture to families, classrooms and libraries in an engaging way,” says author Stacy Bellward. Please call if you would like more information to do a book review or you wish to interview Paul or Stacy Bellward, meet their gorgeous girls and talk about Ethiopian adoption and how it has changed their lives. For much more information about our family and Stacy’s books: www.amharickids.com.